Amopé is defined as “love my feet” in the beautiful language of Portuguese; this brand was fashioned out of the idea that skin care and beauty shouldn’t stop at the ankles. Their mission is to make it easy for you to love each and every step that you take. 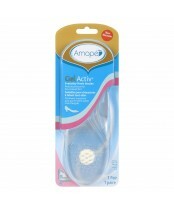 Amopé offers a range of specially designed foot care and pedicure products, created by foot care experts that make a positive difference in the way your feet feel and look. Thanks to Amopé, you can show off your confidence every step of the way.